P.S. 132, eyed for closure by the DOE earlier this year, received a C grade on the latest report card. NORTHERN MANHATTAN — P.S. 132 Juan Pablo Duarte is once again on the Department of Education's list of at-risk schools, less than a year after the city made an aborted attempted to shut down the Washington Heights elementary. Juan Pablo Duarte's inclusion on the list came a day after the school received a C on the department's latest progress report cards. The school was given D grades in 2011 and 2012. The DOE eyed the school for closure after its 2012 report card. The city backed off only after intense community pressure forced it to reconsider, and the DOE instead opted to co-locate Dos Puentes Elementary school into P.S. 132 decade's-old building. Juan Pablo Duarte is joined on the DOE's list by P.S. 152 Dyckman Valley and the the High School for Health Careers and Sciences. The DOE grades measure student progress, student performance and a school's overall learning environment. Schools that received D or F grade or three consecutive C scores can be placed on the at-risk list by the DOE, and can be eyed for closure. A DOE spokesman said that no proposals for school closures would be announced before the new year, when incoming mayor Bill de Blasio takes over. Instead, the department would hold conversations with the schools to determine the cause of their poor performance, the spokesman said. 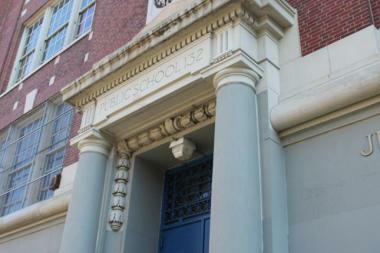 More than half of schools in District 6, which covers parts of Harlem, Washington Heights and Inwood, received A and B grades. Despite its place on the struggling schools list, P.S. 132 is one of four elementary schools that improved from D grades on last year's report. The other three include P.S. 5 Ellen Laurie, Muscota New School and P.S. 173. Ellen Laurie scored C grades on the new reports, while Muscota and P.S. 173 drew B grades. Three elementary and middle schools in Washington Heights and Inwood were given failing grades. The Manhattan Middle School for Scientific Inquiry and P.S. 4 Duke Ellington scored D grades while P.S. 152 Dyckman Valley received an F.
None of the principals immediately returned calls for comment.